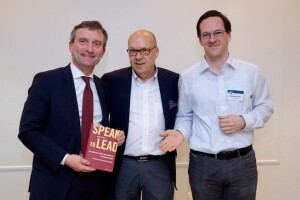 Worldwide the only book about speeches, published by members of a toastmasters club! The credo of the 22 authors is: “Giving a speech is not a form of art, but primarily a craft with tools!” Its precise application and perfection can be learned. They have marked this book with colourful highlights of checkpoints, knowledge, recommendations for sharpened use in every speech. People like you and I have created this work: business people, media and business consultants, students, IT experts, entrepreneurs, coaches, communication trainers, a business photographer, medical professionals, teachers, lecturers, lecture speakers and many more contribute a concentration of knowledge to 60 chapters. Even a Japanologist wrote one in German. Many findings have been gained in practice. Also sometimes under not the best of conditions. The authors are familiar with complex power points, which sometimes stall one minute before the start of the speech, so they had to ad lib the speech without aid of the presentation. Some got to know and overcome for the first time on stage, how to deal with the excitement and the drying up the mouth and even the icy silence of the audience in the case of too deep a thesis. All of that they have processed in Speak to Lead. Everyone has to talk in his life: the student at a lecture, the student in the exam, the manager at the presentation of a new concept or a self-presentation at a new team, the salesman before his customers, the freelancer at an acquisition seminar, the gallery owner or store owner at the opening or presentation of a new collection. Oral applications, concept presentations, debates, discussion rounds, press conferences, lectures at specialist conferences, application to investors and many more are the key to success today. For all these and more, this book was written. Of course – whoever says something different, is cheating – a book cannot replace practicing and consequently not the Düsseldorf Toastmasters. But anyway, of course everyone knew that.